The Sandra L. Olson Lung Cancer Fund, Inc is a non-profit with a purpose of raising money and awareness for lung cancer research for Massachusetts General Hospital in Boston, MA. Lung cancer is often a fatal cancer discovered too late. The doctors at MGH are working hard to develop drugs and techniques that target specific cancer-causing genes and to ultimately find a cure. Click here to purchase tickets and donate. Grammy Award-winning vocalist Steve Tyrell is truly a renaissance man. In his four and a half decades in the music business he has achieved great success as an artist, producer, songwriter, music supervisor, and performer. With his breakthrough performances in "Father of the Bride" movies (I and II), Steve reinvented and re-popularized classic pop standards for a modern-day audience. Steve has produced hits for Grammy-winning artists ranging from Linda Ronstadt and Aaron Neville, to Rod Steward and Diana Ross. Steve himself has sold hundreds of thousands of albums with his hits covering from, "The Way You Look Tonight", "The Simple Life", "Crush On You", and "The Sunny Side of the Street", to many more....! Please click on Donate to purchase tickets! Since 1989, the legendary Scullers Jazz Club has presented the biggest names in straight ahead, Latin and Contemporary Jazz, as well as Blues, Soul, R & B, Cabaret and World Music. 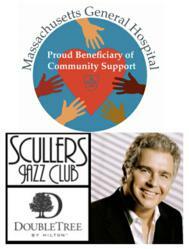 Scullers Jazz Club has hosted some of the very best musical artists in the business including; Chris Botti, Roy Haynes, Jamie Cullam, David Sanborn, Arturo Sandoval, Christian Scott, Tony Bennett, Esperanza Spalding, Christian McBride and Wynton Marsalis to name a few.